It’s crucial to learn from both the benefits and shortcomings of traditional performance management strategies in order to develop an effective modern strategy. Historical records suggest the use of formal performance reviews dates back at least as far as the year 230 — centuries before the advent of electricity, steam engines, and the printing press. Although they’ve had millennia to evolve, the structure of performance reviews remained largely unchanged over hundreds of years, with contemporary criticisms striking a resoundingly similar tone with Sin Yu’s. Despite these long-standing criticisms, performance evaluations in this format became even more prevalent over time. As Peter Cappelli and Anna Tavis explain in “The Performance Management Revolution," about 60 percent of U.S. companies had some kind of formal employee performance evaluation process by the 1940s, and that number rose above 90 percent in the following two decades. It’s hard to imagine this practice lasting nearly 2,000 years and being adopted so widely without exhibiting some meaningful benefits — and there are some — but those benefits are often hampered by a format that is out of step with the wants and needs of a modern workforce. With that in mind, we’re going to extract the most beneficial elements from some of the most common traditional performance management strategies and use them to develop a well-rounded, modern approach. Annual employee reviews were originally designed to help organizations separate top performers from low performers, but as time went on, these performance reviews began to play a role in compensation, promotion decisions, and employee development programs. A typical performance evaluation is an annual meeting between manager and employee. It’s usually scheduled sometime around the end of the fiscal year in order to cover that year’s results, and to make similar comparisons across employees. During a traditional employee evaluation, both manager and employee review the employee’s key strengths and weaknesses, ideally with visible evidence of both. The process ends with an overall assessment of how well the employee met expectations, followed by setting performance and development goals for the next year. Provides a standardized measure for employee performance and progress. Helps employees understand how well their work matched up with organizational/managerial expectations. Identifies areas where an employee’s skills can or should be improved. Subject to both conscious and unconscious biases. Focuses on accountability and praise for past actions, rather than inspiring future contributions. Infrequent cadence denies opportunities for timely course correction. Dated feedback is often irrelevant in relation to current projects and objectives. Often time-consuming and expensive to administer. Can damage morale and motivation toward future contributions. Contrasting objectives: reviewer is often focused on areas for improvement, while reviewees are often focused on compensation and career advancement. With a goal of standardizing processes and making more fair, quantifiable, and safe employment decisions, many organizations assign numerical ratings representative of the overall value individual employees bring to the organization throughout the year. This quantitative approach to employee ratings provides the perception of greater accuracy and objectivity in employee evaluations, particularly when they influence compensation and termination decisions. The two most common approaches to employee ratings include a numerical scale (usually a scale of 3, 5, or 7), or a set of standardized descriptions (for example: fails to meet expectations, meets expectations, or exceeds expectations). Ratings creep is a phenomenon common to employee rating scales in which managers knowingly give artificially inflated scores. This can happen for any number of reasons, from managerial biases toward their own teams, to time savings on a task getting in the way of a manager’s other duties, or simple conflict avoidance behavior. While it may seem benign at first, ratings creep can be detrimental both to employees and the organization because without accurate, candid feedback, employees can’t course-correct effectively, resulting in a lower standard of performance organization-wide. Although employees reportedly appreciate the feedback gained through performance reviews, this structure and its execution leave much to be desired. Research from Aon found that only half of employees believe their company assesses performance effectively. Quantitative/measurable representation of an employee’s contributions. Standardization of employee performance feedback data.managerial expectations. Employee contributions can be difficult or impossible to quantify on a numerical scale. Applies a quantitative lens to an innately qualitative subject. Frequently ineffective in assessing performance. Lack of context in ratings. Stack ranking, also known as forced ranking or forced distribution is a practice of rating employees in comparison to their colleagues, rather than on their individual merits. When applied to an annual review, the forced distribution method gives every employee one rating, which is used to manage out the lowest 10 percent, generously reward the highest 20 percent, and coach the middle 70 percent on how to reach the top 20 percent. Believed to be an effective tool for increasing organizational efficiency, the forced distribution method achieved adoption in 60 percent of the Fortune 500 companies by the early 2000’s. "People need to know where they stand. Failing to differentiate among employees — and holding on to bottom-tier performers — is actually the cruelest form of management there is." While the sentiment behind Welch’s philosophy may have been well-meaning, as is often the case, practices designed for use in exigent circumstances don’t translate well outside of that context. In fact, research indicates that performance actually declines when employees are rated against one another. With the knowledge that a poor ranking could lose them their job, employees are less creative, less collaborative, and struggle more with stress. The understanding that achieving a top rank is dependent on outranking colleagues also has a propensity to breed a highly competitive atmosphere that can discourage collaboration, promote distrust among colleagues, and even inspire negative behaviors like sabotage. Given the deeply problematic nature of stacked ranking, GE and many other industry giants dropped it for a more effective approach. Arbitrary ‘yanking’ of otherwise well-performing employees. Increased stress in the work environment. Employees are rated against one another, rather than being evaluated based on their individual merits and contributions. Can inspire unhealthy competition (even sabotage) among colleagues. Loss of institutional knowledge through arbitrary dismissals. It's time to take our learnings from performance management’s past, and begin to design its future. In the next chapter, we'll take a closer look at the evolution of modern performance management processes being used in some of the world's most successful organizations. 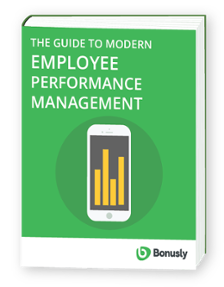 Just as with traditional performance management strategies, we'll look at the key benefits of these modern strategies, and identify easy ways your organization's own modern strategy can benefit from them.